This is a quick nutritious meal that’s vegan, gluten-free, and soy-free. 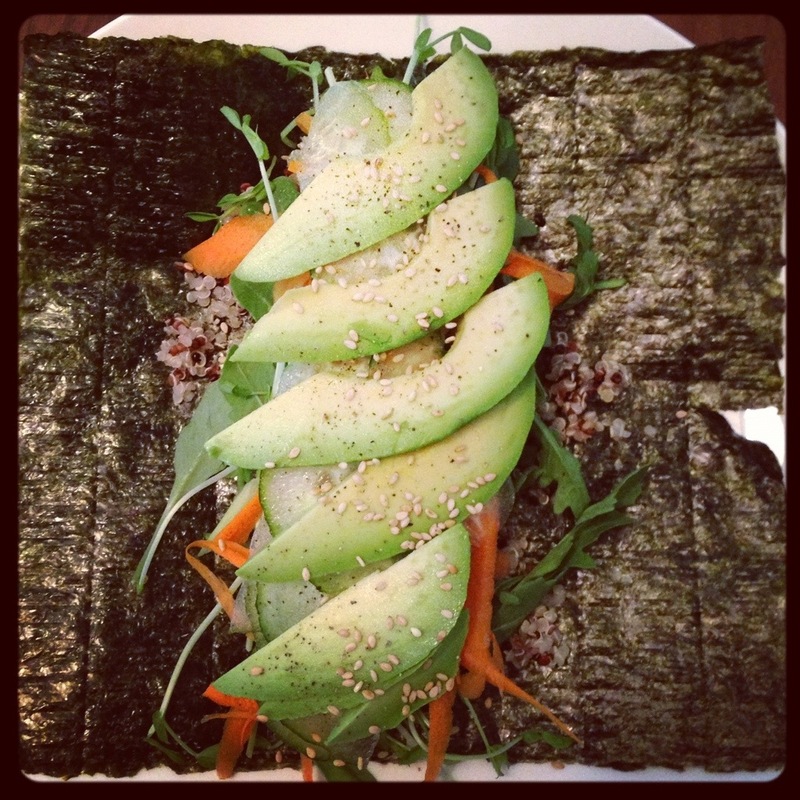 The quinoa is protein-packed and the seaweed is full of omega fatty acids (ie makes your heart and brain happy). Who couldn’t use a little happiness there? Note: These amounts are only an estimate. Just put as much as you think will be able to roll up. Lay out one sheet of nori with the shinier side down. Spoon quinoa in the center in about a 2-inch strip. Spray the Bragg’s over the quinoa (more or less depending on how much you like the salty soy sauce-like flavor). Add the rest of the ingredients over the strip of quinoa. This will make it easier to roll. To roll it, wet your finger tips and and dab the ends of the seaweed (this makes it sticky). Then with both hands tuck the free end of seaweed that’s closer to you over the inside ingredients and onto the other free end. Squeeze the wrap to make sure the ends are sticking together well. 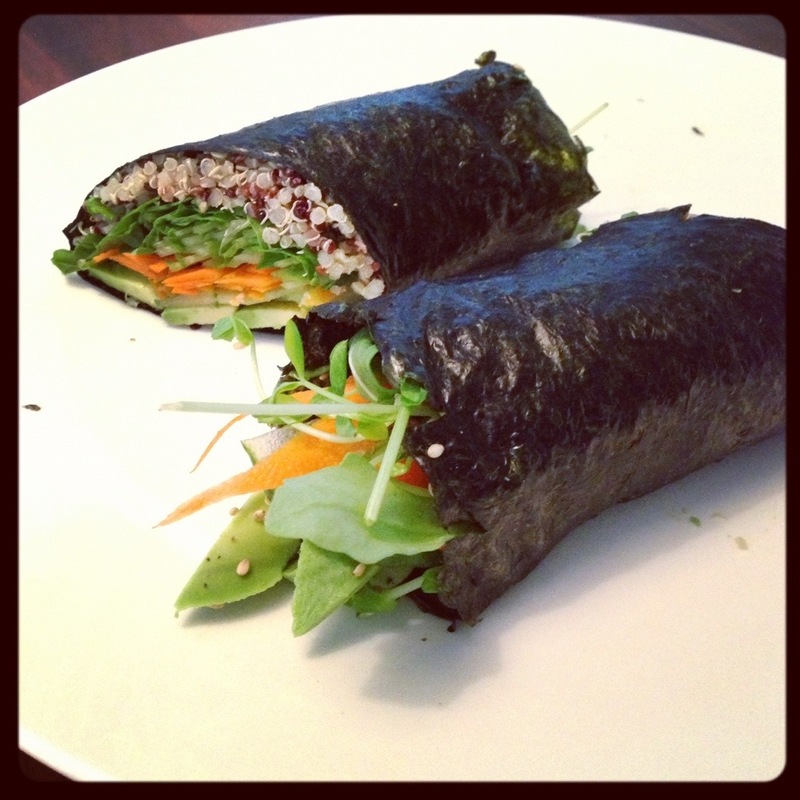 (There should be a description of how to make a roll on the seaweed package. Refer to that for a better explanation.) Then wet a sharp knife and cut your wrap in half for easy handheld eating.